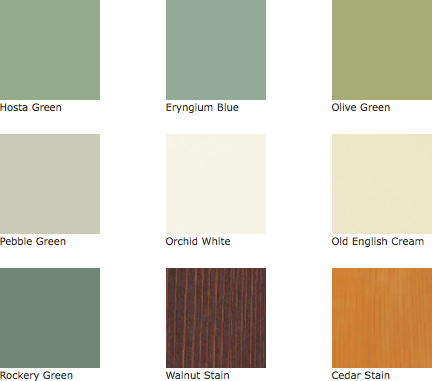 Design Your Perfect Summerhouse With Our Colour Options. The summerhouse colour chart featured are for illustration purposes only and on digital display will vary from the actual painted product. This is just a selection of the colours available, you can also select to have your summerhouse painted in your own choice of colour. Orders can be made by telephone & paid for by bank transfer, cheque or credit/debit card. For most people, choosing a summerhouse is very much the easy part, and most deliberation is spent over exactly what colour finish to go for. The choice you make will depend on the style of your house and garden. Also the setting and how you want your summerhouse to work within it as well as your own. The right summerhouse, in the right place, painted in the right colour could become a unparalleled sanctuary for you. A garden summerhouse or gazebo can create a wonderful focal point as part of your whole garden design. You may want it to stand out and make a statement. Or blend in with your favourite garden features. For inspiration take a look at our customer galleries to see how our customers have coloured their summerhouses beautiful.